Melusch-Dil is proud to offer you an array of high quality services not available elsewhere in Palau. To address the challenge of reaching and maintaining good health and well-being, there are many services offered using a variety of procedures, from massage to salon services to skin care. A package can be created to best suit your unique needs, and our experienced and specially trained staff is happy to help. Browse over the list below to see the many services you can avail yourself of at Melusch-Dil Skin Care & Wellness Center. Come on... You Deserve It. Our skin needs oxygen to breathe, replicate, and regenerate. As we age, the micro-capillaries degenerate and skin does not receive the nourishment it needs. As a result, the metabolism of our skin cell slows down, collagen and elastin content are reduced and fine lines, discolorations, and wrinkles begin to appear. Exposure to sun, air pollution, and day-to-day stress all affects the condition of the skin. Adding oxygen to your facial will soothe and instantly refresh your skin for a pampering experience. The result is a cleaner, plumper, smoother face and a younger looking "YOU". 4. Regenerates new skin that leaves it softer and smoother. Infusing anti-aging Q10 - a light anti-aging cream with established enzyme Q10 and micro-lifting serum treatment (a concentrated skin lightening formula that improves fairness, tone, texture, and radiance). It visibly reduces the depth of fine lines and protects against the effect of premature light enduced aging, giving the skin a smoother finer appearance. A non-aggressive treatment designed to dessolve impurities while deeply cleansing the pores, improving skin clarity and reducing the acne marks and blemishes. Goes with scalp, shoulder, and hand massage. 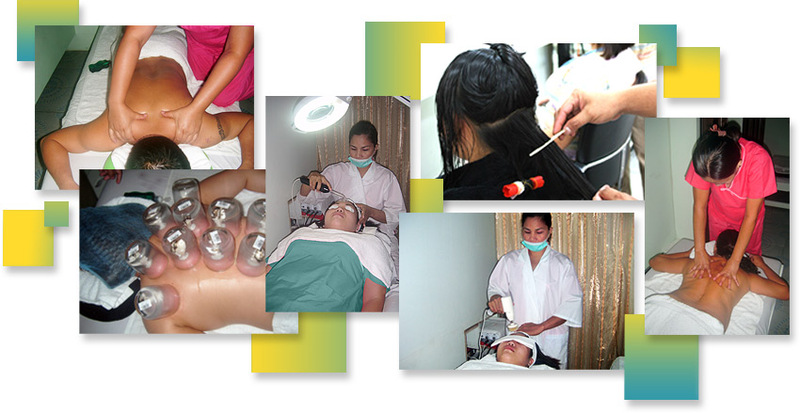 Includes: Callous removal, foot scrub, Paraffin wax with Vitamin E (w/ Whitening), Foot Massage & Pedicure. Please contact us to inquire of our prices and specials offers we may have. If you are interested in any of our services, make an appointment with us today!